The future’s made of virtual insanity. The very near future, to be exact! Sony/Tech InsiderSoon, you’ll be able to look like this guy. Sony announced Thursday that it will bring PlayStation VR, its PS4-exclusive VR headset that’s meant to be more affordable than its competitors, to select GameStop and Best Buy locations across the United States and Canada. That means it will be easier than ever for people without extremely powerful and expensive PCs to try out VR for the first time. The rollout will begin slowly, with just 30 locations getting demo stations starting June 17. That number will balloon to more than 300 starting June 24, with the demo stations only open on certain days during certain hours. To see the full list of cities and specific stores where you can try PSVR, check out this post on the PlayStation Blog. The retail demos will include games like “EVE: Valkyrie,” a space dogfighting game and “Battlezone,” an arcade throwback tank battling game. 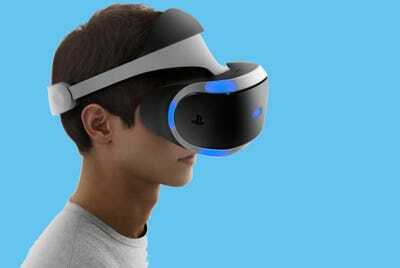 For the uninitiated, what separates PSVR from its main competitors, Oculus Rift and HTC Vive, is that all it requires is a PS4. You don’t need a powerful gaming PC to play its games. Mind you, with a starting price of $400 when it launches in October, it isn’t cheap, but it will supposedly support 50 games by the end of 2016, meaning you’ll at least have something to do with it. It’s fantastic and incredibly important that Sony is doing this. People won’t believe in the power of VR until they try it, and right now, the only way to try it is to have exorbitantly priced hardware or know someone who does. We just hope someone properly wipes down those helmets after people are done with them.